A Classic, Ocean-View Cottage in Downtown Nantucket accommodating up to 4 guests. 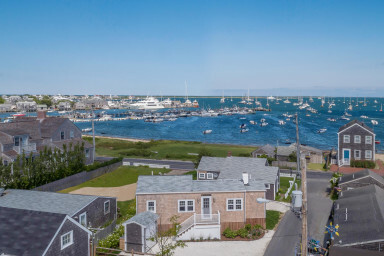 Create lasting family memories in downtown Nantucket with a stay at Why Knot, a classic, shingled vacation rental in the historic heart of town. Ocean views are on full display from your dining room table, while shops, restaurants, and harbor beaches are mere steps from the front door. Park your car in the white shell driveway lined with hydrangea bushes, and head inside this 2-bedroom, 2-bath cottage. Feel right at home from the moment you arrive, with nautical touches, a fully equipped kitchen, and an open-concept layout that brings families together. Get some fresh air on your harbor-view deck with gas barbecue grill, and kick back in an Adirondack chair while dinner cooks to perfection. This is relaxed coastal living at its finest! White panelled walls and ceilings lend cottage charm in the open-concept living area, where seafoam green accents add a beach-inspred pop of color. Settle onto the plush sofa and armchair for movie nights on the flat screen TV. Or gather around the wood-burning fireplace with white brick hearth, and swap stories from the day’s adventures exploring Nantucket’s cobbled streets. Outfitted with sleek countertops, stocked cabinetry, and a full suite of stainless steel appliances, the classic white kitchen features clean lines, modern fixtures, and plenty of space to prep. Invite the family to lend a hand at the center island bar for four, and savor your home cooking in the ocean-view dining area, where a round glass table seats four. For a taste of open-air dining, swing open a set of French doors to let in the sea breeze, and watch as ferry boats drift into the harbor. Craving a summer barbecue? Fire up the gas grill on your water-view deck. In the evenings, rest up for the day ahead in two comfortable bedrooms, including a private master suite with a chic blue and white palette. Drift to sleep in the plush king-size bed, and wake each morning to peaceful sea views. The bedroom also includes its own flat screen TV and ample space to store your luggage. The kids will love climbing into two twin beds in the guest bedroom, featuring crisp white linens and lots of natural light. Just off the main living space, the full guest bathroom is perfect for getting ready in the morning. During your stay at Why Knot, spend leisurely vacation days along Nantucket’s harbor beaches; discover boutique shopping and exquisite dining; or learn about Nantucket's nautical history at the whaling museum —all are on your doorstep at this center-of-town retreat.